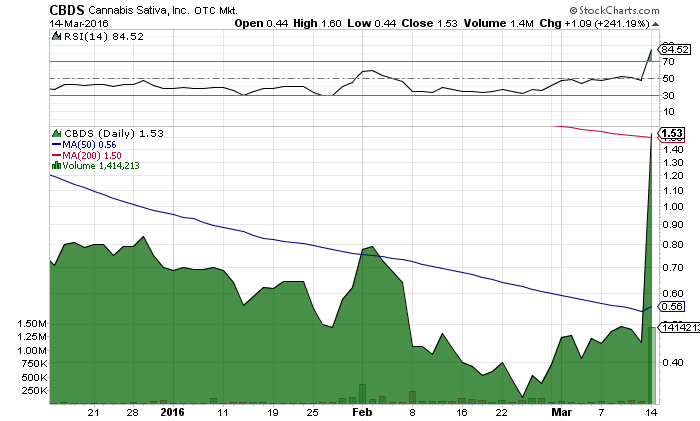 Cannabis Sativa Inc (OTCMKTS:CBDS) made a late day surge starting at 11:00AM and surging through the end of the day. The stock locked in staggering gains of over 240% on record setting volume for CBDS. Over 1.41 million shares traded hands compared to its daily average of 0.073 million. Volume was 108 times average daily volume. The stock gained $1.09 ending the day at $1.53. Recent developments show that CBDS has entered into a licensing agreement with an Oregon based company to brand hi Chocolate Bars. Its wholly owned subsidiary company HI Brands International entered into an agreement with Trike Candy, LLC to brand chocolate bars in the Oregon recreational market. Trike Candy is licensed with the state of Oregon to process cannabis infused products for sale in the recreational markets. CBDS has a 52-week high of $5.80 and recently staged a mind boggling rally from its $0.30 low to its intraday high of $1.63. The stock has gained over 400% since setting a 52-week low a few weeks back rewarding investors who have recently entered the stock. CBDS has international, global ambitions. The company believe that cannabis is destined to become the next gold rush and has prepared to capitalize on the growing industry. It has assembled the team, the talent and the experience necessary to brand and market the highest-quality cannabis products available today. CBDS plans to innovate the future of casual cannabis through infused products and other innovative means. CBDS is currently trading at a $25 million market valuation. CBDS has surged on record volume and has been rallying since hitting its 52-week low. Is this just another bear market rally or is this a sustainable advance built on fundamental or product development? Stay tuned for updates and alerts so you don’t miss a beat. We will be updating on CBDS when more details emerge so make sure you are subscribed to Microcapspot so you know what’s going on with CBDS. Disclosure: we hold no position in CBDS either long or short and we have not been compensated for this article.